Chanteur Country US né le 5 Avril 1940 à Dyess (Arkansas). Tommy Cash est le jeune frère de Johnny Cash. 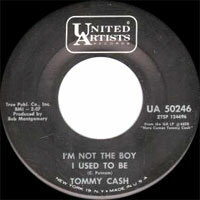 Younger brother of the Man in Black, Tommy Cash enjoyed some chart success in his own right. Born April 5, 1940, in Dyess, AR, Tommy was eight years younger than big brother Johnny. He formed his first band in high school, but enlisted in the Army soon after graduation. While serving in Germany during 1958, he DJed for Armed Services Radio — perhaps contributing in some part to the incredible success of Johnny's hit of that year, "Ballad of a Teenage Queen." 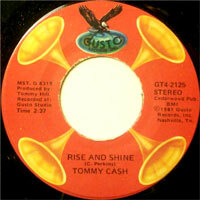 After resuming civilian life in the early '60s, Tommy played with Hank Williams, Jr. and gained his own recording contract from Musicor by 1967. 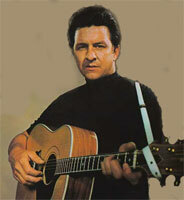 After a move to United Artists, he just missed the country Top 40 in 1968 with "The Sounds of Goodbye." Transferred yet again, to Epic Records, Tommy delivered his biggest hit — "Six White Horses," a tribute to JFK, RFK, and Martin Luther King, Jr. — in late 1969. 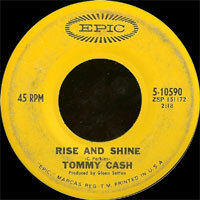 The single hit number four and was followed by two Top Ten singles in 1970, "Rise and Shine" and "One Song Away." 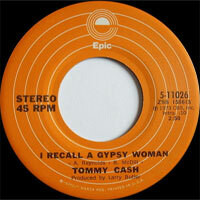 During the '70s, Cash continued to tour and record — for Epic, Elektra, 20th Century, and Monument — but his only Top 20 entry occurred when "I Recall a Gypsy Woman" made number 16 in 1973. 08/1966 SP UNITED ARTISTS 50068 (US) All I've Got To Show / ? 12/1975 SP 20TH CENTURY FOX TC 2263 (US) Broken Bones / ? 198? SP RCI 2407 (US) Radio Lover / ? 1990 SP PLAYBACK 1352 (US) Hank And George, Lefty And Me (with George JONES) : ? 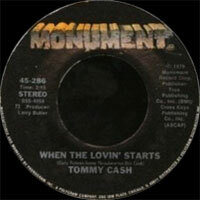 1990 SP PLAYBACK 1363 (US) Guess Things Happen That Way (with Johnny CASH) / ?